Two conferences were represented earlier this month in this year’s NCAA Frozen Four in St. Paul. Eventual champion Minnesota Duluth (NCHC) and Notre Dame (Big Ten) played for the 2018 title. This was the first time since 2005 that three schools in the same conference – Notre Dame, Ohio State and Michigan, all from the Big Ten – made the final four teams. But here’s a historical footnote to this year’s Frozen Four: Three Black players, two of them on one team and all three from the same conference, were on the ice, a first somehow overlooked by other commentators. When asked when hockey players of color (HPOCs) will get past being novelties, Nate Ewell told the MSR between periods of the 2018 NCAA championship game, “I think everybody in hockey would like to see that day.” He’s the deputy executive director of College Hockey, Inc., founded in 2009 to “extensively” promote Division I men’s college hockey to prospective players and fans. 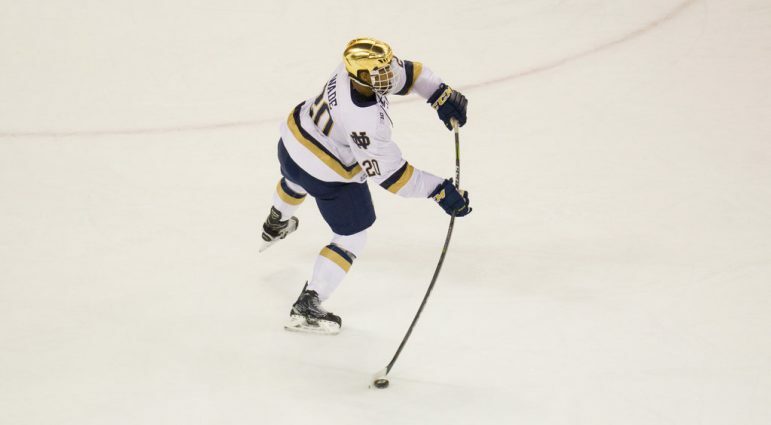 “It feels great to see players of color,” Notre Dame senior defenseman Justin Wade exclaimed. He was the only Black player among the two finalists as the Irish finished as runners-up. He also was on the ice when Notre Dame scored the game-winner with six seconds left to defeat Michigan in the semifinals. Wade, an Aurora, Ill. native and IT management major, finished his college career with nearly 150 blocks, but he also led his team this season in penalties (16) and penalty minutes (54). But he didn’t spend any time in the penalty box during the Frozen Four. “I played football, then hockey” as a youngster, the 6’-1” player told me after the semifinals. “I incorporated my football abilities with hockey. I played the game the way I thought. 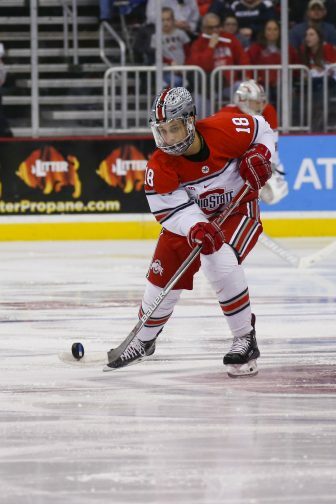 Joshua, a 6’-3” junior forward from Dearborn, Mich., assisted on the Buckeyes’ only goal in their 2-1 loss to UMD, his 11th assist of the season. “I’m proud of our guys, and we gave it a good fight,” he told me afterward. He led the Big Ten in faceoff winning percentage (.594) and finished sixth in the nation this season. Joshua won nearly 67 percent of his faceoffs in the NCAA Midwest Regional as well. 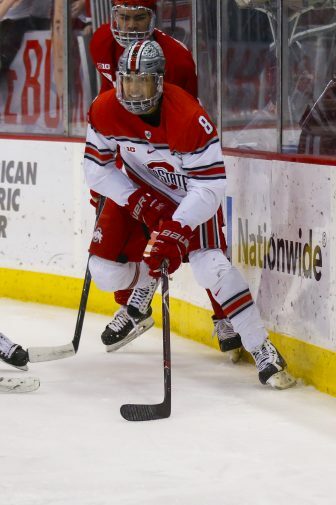 Second among Big Ten scorers in power play goals (four), Joshua, a sport industry major, and senior forward Christian Lampasso of Amherst, NY were among 15 Ohio State players named Academic All-Big Ten. Lampasso, a 5’-10” industrial and systems engineering major, scored a career-best 10 goals this season, nearly quadruple his goal output from his first three years. He had only four tallies to his credit coming into the season. More and more Blacks are playing hockey today at all levels, but their numbers still are comparatively miniscule. Wade believes that the cost of playing hockey can be an economic barrier hard for some players of color to overcome. “I hope kids that are younger are looking at me and Dakota [and] saying, ‘These kids made it… Hey, I got a shot. If I put my work in and work as hard as I can, then I can do it [too],” Lampasso said. “Someone like me or the two others who are here…seeing us on TV goes a long way for the next [Black] kid seeing us and wanting to follow,” Joshua added.